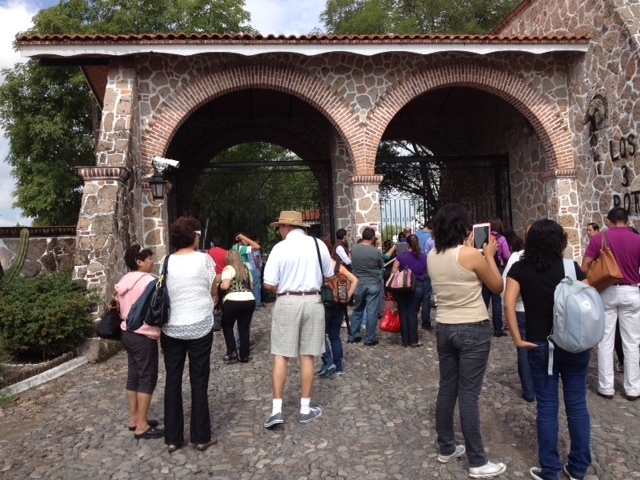 Mexico Part: 4 Waiting for access to Vincente Fernandez’s ranch. We’re riding along. The weather is good. Our driver and tour guide, Gloria, is chatty, fun and engaging. If only I could understand what she was saying. She has everyone in the bus introduce themselves and everyone claps after each says their name and where they are from. She cracks many jokes. She tells me in English that she can’t translate jokes into English because they are not funny in English. Gloria tells me the organizer assured her there were no English speaking people on this tour. She is shy about her English because she has been studying it for only six months. We pull up to a beautifully maintained ranch, high white walls with the top trimmed with yellow and brown. We pile out of the bus, joined two other buses loads of people (including the Tequila bus) and mill around in front of the large ornate iron gates. It’s a hot sunny day and there are lots of people of all ages. Look at all those jeans! We wait and wait. Gloria is on her cell phone a lot. There is a problem, but I have no idea what it is. Gloria tells us to go to the store beside the entrance to the ranch for 5 minutes until she figures it out. She tells me that in Mexico they say 5 minutes but it really means 30 minutes. My skeptic self thinks this is a ploy between bus drivers and store owners to get sales. But I need to find el bano so am happy to go to the store. The store sends me to the restaurant beside them. Off I go. It’s getting urgent. Relieved, i go back to the store. Finally, Gloria sends word for us to come back. But more milling around. The people on the Tequila bus get back on their bus and leave. Gloria gives us the scoop in Spanish. A woman (from the other bus going to Chapala) standing beside me, translates for me. She noticed I didn’t speak Spanish. Apparently, the day before, a Tequila tour stopped to see the ranch. The famous singer was at home and accommodated families who wanted a photo with him. While he was doing this, many of the other tourists rushed up to him all at once. He was very upset by this. He insisted today’s Tequila bus tour leave. (See, I was not meant to go on the Tequila bus). Next: We finally get to tour of the ranch. Mexico Part 3: Oooops. I’m on the wrong bus! 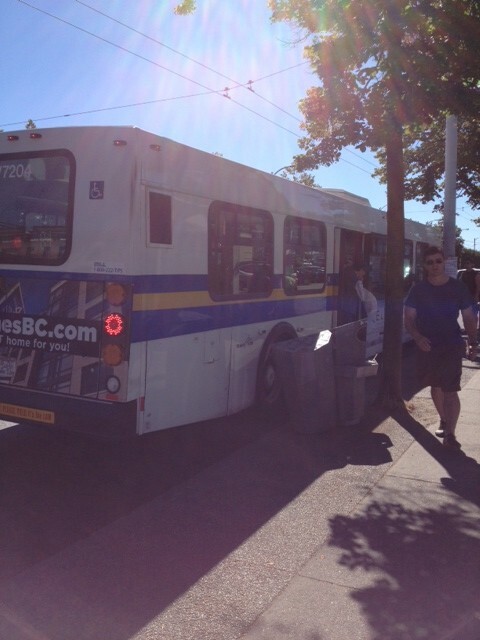 Today, (Wednesday, July 17/13) another good day for touring. Yesterday, I’d talked to Thomas, one of the two English speaking porters, about the tour and put a deposit on a tour of Chapala. After breakfast, I put my valuables in the caja de seguidad and waited for the tour bus to pick us up. When I go to get on the bus I realized I’d grabbed the wrong ticket. I had the ticket from the tour the day before. Thomas told the driver I’d paid a deposit and I got on the bus. I assumed I was on the right bus because Thomas knew I wanted to go to Chapala. On the two monitors in the bus, a video of Vicente Fernández, the famous 74 year old Mexican singer, was showing. As we traveled along, the tour guide discovered I was the only Gringo (Ooops. Perhaps it’s not politically correct for me to use that term) on the bus. She said her English was not so good, but after a couple of Tequilas it might get better and perhaps after a couple of tequilas my Spanish might get better. That’s when I realized I was on the wrong bus. This bus was going to one of the places that makes Tequila. Because Thomas knew i wanted to go to Chapala, I assumed he put me on the right bus. (Note to self: in the future, Check out assumptions, double check out assumptions.) Also, it would have helped if I’d had my correct ticket. I told her I was going to Chapala. “That’s a problem”, she said and turned to the driver. Several turns later we met up with another bus. I was transferred over to the other bus. A couple from that bus were transferred over to the Tequila bus. Somebody else got on the wrong bus or maybe just changed their minds and decided they needed some tequila. I didn’t feel so bad. So relieved, I now was on the tour I wanted to be on. The problem was solved. Nobody is upset. everyone is happy. This is Mexico. The first thing I noticed when I started walking to the town square was the big Walmart next to the hotel. Then the Sears store, The Scotia Bank, Wendy’s, Starbucks – I could go on an on. I wondered for a bit what country I was in, but the Mexican music blaring from the TVs in most shops let me know I was in Mexico. The next thing I noticed was the clothing. 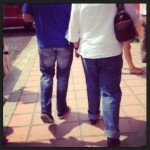 Many people are wearing blue jeans even though it was a hot day. All ages wore them, elderly people down to a toddler in blue jeans bibbed trousers. There were plain ones, studded ones, new ones, old ones, loose ones, tight ones (mostly tight ones), ones with holes in them and even shorts made of blue denim. It almost seemed like a uniform. Then I noticed how affectionate the people are. People held hands, again all ages. parents held the hands of young children but also adolescent children. Mothers and adolescent children, sons as well as daughters walked arm in arm. Women friends often were walking arm and arm. Of course there were lovers walking arm in arm and often canoodling in the streets and on the tour buses (like the couple sitting right in front of me). Children were everywhere and seemed loved and accepted. The buildings around the cathedral and town square are beautiful. A lot of the city that I saw was ordinary. What stood out for me were the few buildings, here and there, along the tour that are obviously well cared for. They have fresh colourful paint and lots of flowers hanging from their windows and balconies. They were like gems among stones. I got off the bus in Tlaquepaque , an Artisan area, to site see, shop and have lunch.